Mac OS does not support both reading and writing on NTFS Flash Drive by default. Look at the following tutorial to enable NTFS read/write support in Mac OS X El Capitan, Yosemite or older OS X versions. No matter which OS using (OS X El Capitan, Yosemite, Mavericks or older OS X versions), it comes to pretty quick and easy solutions to mount, read and write NTFS Partitions on Mac. The below 2 methods will make it doable (the solution 2 is complicated by using Terminal, but 100% works well). At for paid Mac NTFS softwares, there are just only two brands in town. Tuxera NTFS 2015 now support OS X 10.11 El Capitan fully. However it costs too much money like steal for the license. Paragon NTFS 14 works perfectly in OS X versions (Mavericks, Yosemite and El Capitan). Both above paid softwares are great. 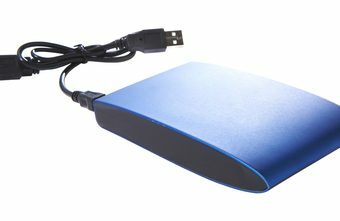 However, we suppose Paragon NTFS 14 is the much better choice since it comes with cheaper cost, works more effectively than Tuxera 2015, and especially offers 30-day-money back to guarantee for the quality. We do not talk about why Mac OS X does not support full NTFS itself or why This feature is hidden from Mac OS X. We absolutely can use Terminal command to manually Enable NTFS write support. Let’s see how it works. 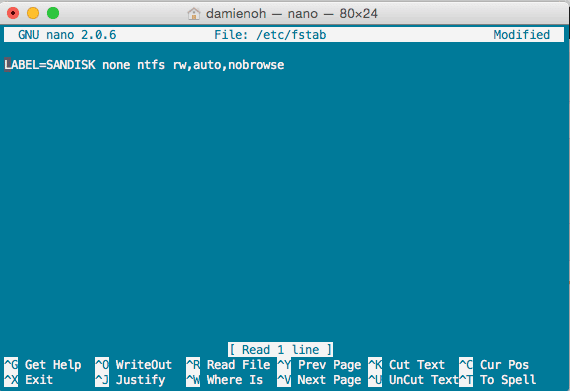 You now are brought to a program called nano and it’s the text editor that’s built into Terminal. The file that you’ll edit is called stab. Notice: DRIVE_NAME is the name of the drive. The drive’s name should contain no spaces, as adding a space to the configuration file would tell your Mac to interpret whatever’s after that space as a separate command. If your DRIVE_NAME is made up of two words separated with a space, for example, “NO NAME”, you have to add a “\” before the space for the system to recognize the space. For example, “NO\ NAME”. Universal Unique Identifier can be determined by Disk Utility.